I live in Bangkok and use Skytrain all the time. Many times tourists approached me to ask questions about the station they wan to go to or the right exit they have to take. Even myself I have to ask these questions when I go somewhere I am not familiar with. tâa jà bpai soi Sukhumvit 24, dtông long sà-tăa-nii năi ká? 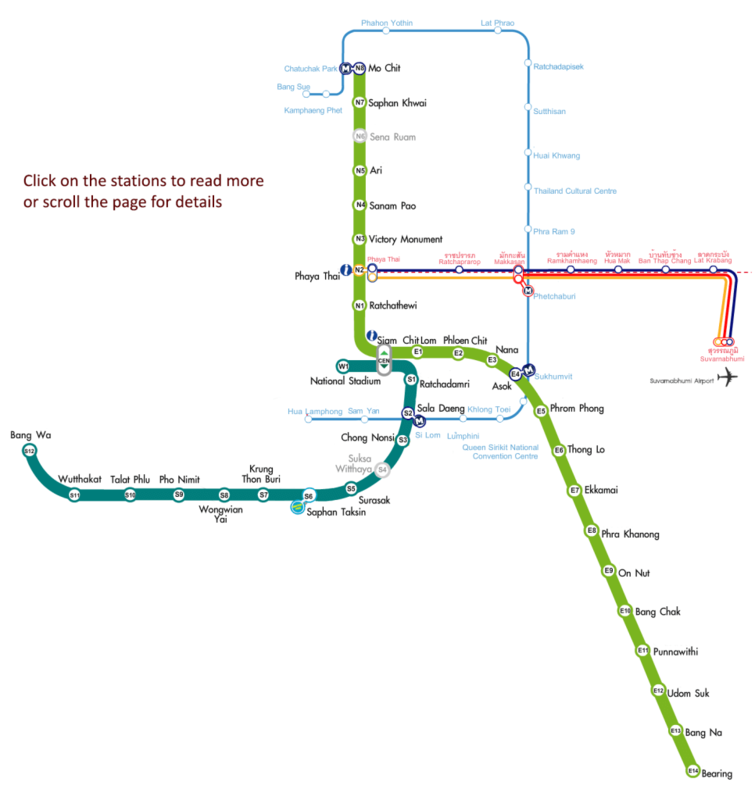 If I want to go to Soi Sukhumvit 24, which station do I have to get off? Question structure in Thai language, the question word is often put at the end. EN Structure: Which station do I get off? TH Structure: I get off station which? You can apply the same pattern when taking the Chaopraya River boat. jà bpai wát prá-gâew, long tâa năi? I’m going to the Grand Palace, Which pier do I get off? EN Structure: Which pier do I get off? TH Structure: I get off pier which? Which exit do I leave? EN Structure: Which exit do I leave? TH Structure: I leave exit which? The BTS Skytrain runs through all important downtown disctricts and major transport hubs in Bangkok, from Mo Chit to On Nut (Sukhumvit Line) and National Stadium to Bang Wa (Silom Line). With connecting points to the MRT Underground, Chao Phraya Express Boats and two land transport terminals at Victory Monument and Mo Chit, it is the best way to get around. i’m a filipino struggling to really learn thai. i am just so amazed by your culture. i have many thai friends & all my room mates before were thais. they used to bring me to all places thai like markets, restaurants & even bars & discos. i haven’t been to thailand but i stepped on your big airport in bangkok on my way to egypt in 2009. only 5 hours though but that was so magical. i wish to come & visit thailand in the near future & totally immerse myself in the culture & the thai way of life. this site is heaven sent for me. i just happen to stumble on it while online. keep up the very good work. Girls, you are the best! You are so helpful as always) The quality of the video is almost like a hollywood movie. Khopkhun ka for your hard work and enthusiasm! Phom gam lang chai rot fai doo-an na pro wah khun laa Pear.Kop kun mahk mahk! It wont be long now and you will be gone to television . Well presented practical out and about video . Kawp khun mak krap Mod and Pear. Have been in Phuket for 24 years but still struggling because I am 83! Never too old to teach an old dog new tricks but it goes much slower. Taught English and German at Phuket Rajabhat University for 22 years. Love the students. Love Thailand. Will be in Phuket again on November 4..
My friend is from Nong Kai. Next time could you find a quieter station to make conversation because it was so noisy!